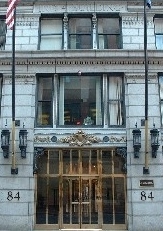 Weston Patrick has resided at 84 State Street since the building was erected in 1903. Located in the Financial District of Downtown Boston, we are convenient to major highways, public parking garages, and steps from public transportation. Our office overlooks historic Boston Harbor and Faneuil Hall. The closest parking garage to our office is located at 60 State Street (From State Street, turn right onto Merchants Row – before the Starbucks – and the garage is on your left). For more information on parking options, you may visit lazparking.com. Our office is conveniently located one block from the State Street station (Blue Line and Orange Line), and two blocks from Aquarium station (Blue Line). For more information about public transportation into Boston, please visit www.mbta.com.